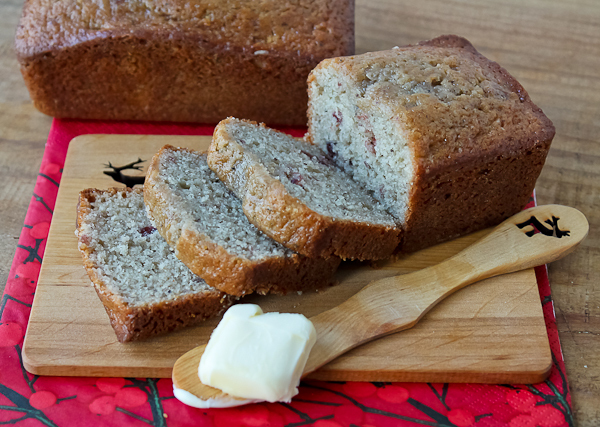 Quick breads make a popular and welcome gift from the kitchen at holiday times for friends and family. 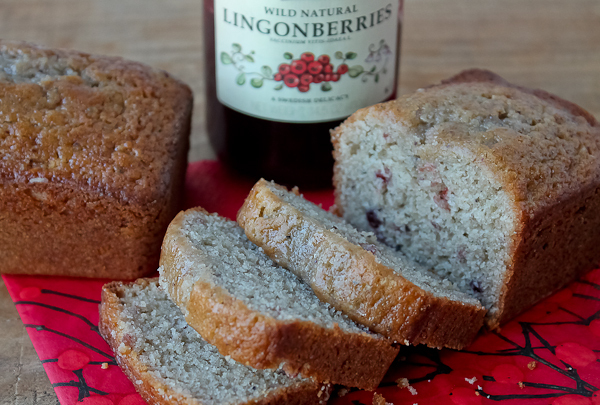 Lingonberry quick bread is something a little different and oh-so-good! Lingonberries are bright red and look very festive, not to mention they are very good for you. The bread is best if you let it cool and wrap in plastic wrap for a day or two. It can be enjoyed alone, or spread with butter. 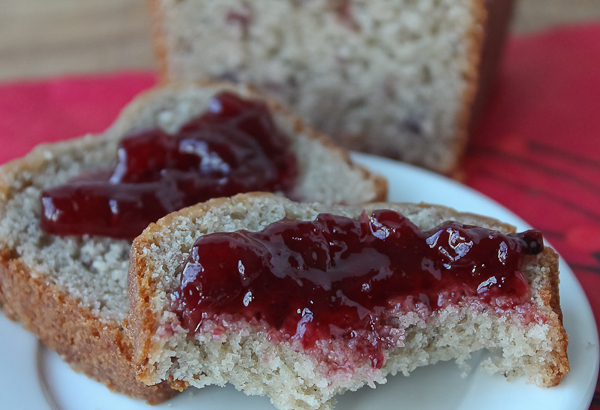 But my favorite way to serve the bread is to spread it with more lingonberry jam! It enhances the flavor even more and looks beautiful. The recipe will make one large loaf or three mini loaves. 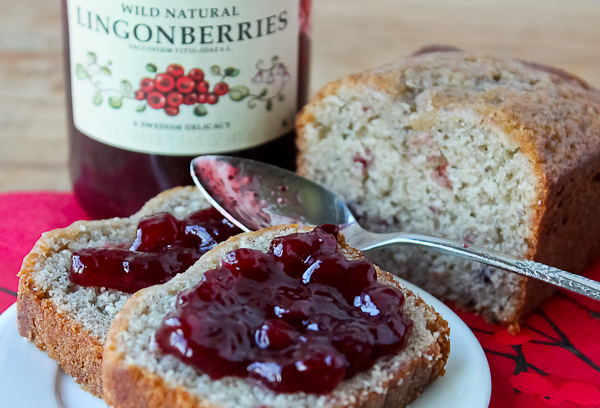 Lingonberry jam can be found at specialty kitchen shops, Ikea, and some grocery stores, or you can buy it online here. The jam is also great on pancakes and waffles, or mixed into Greek yogurt for a breakfast treat or snack. Preheat oven to 350 degrees. Grease and flour one 9-by-5-inch loaf pan, or 3 mini loaf pans. In large bowl of electric mixer, cream the butter, sugar, and eggs until light and fluffy. In a separate bowl, thoroughly mix the flour, baking powder, cardamom, cinnamon, ginger, baking soda, and salt. In another bowl, stir together the sour cream and lingonberry jam. Blend the dry ingredients and the sour cream mixture alternately into the butter mixture just until moistened. Turn mixture into the prepared pan or pans. Bake the large for about 55 minutes, and the mini loaves for about 30 minutes, or until a wooden skewer inserted in the center comes out clean. Let cool in pan for 5 minutes, then turn out onto a wire rack to cool completely. When cooled, wrap in plastic wrap and let sit at room temperature for a day or two for best flavor and texture. I’ve printed off this recipe and can’t wait to make it! Love the spices. Hope you enjoy it, Helen! The cardamom makes it extra special and so fragrant.